Yoda, the “world’s ugliest dog”, has died at 15, her owner announced today. 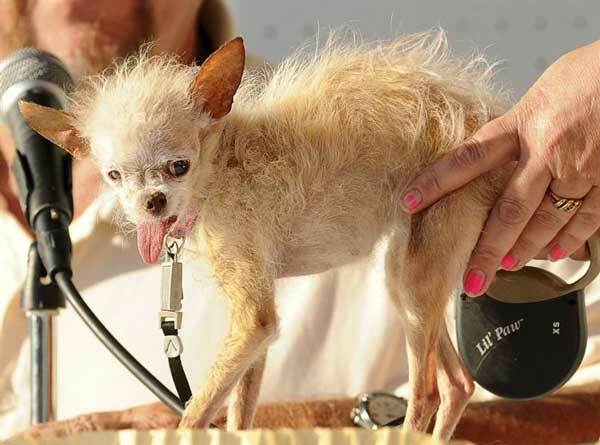 Yoda, a Chinese crested and Chihuahua mix, shot to fame in 2011 when she won the World’s Ugliest Dog contest in California. When Terry Schumacher found Yoda she initially mistook the abandoned dog for a rat, but the animal went on to win a $1000 prize for her looks. Yoda had short tufts of hair, a protruding tongue and skinny bald legs. The dog, which died in her sleep on Saturday, only weighed 1.8 lbs (0.8kg) and lived a rough life before she was found behind an apartment building. After the competition Yoda appeared on television and even featured in makeover show.